Back in 1990, Kenya announced that it had built its own car. The Nyayo Pioneer had been developed at the behest of then president Daniel Arap Moi, who had commanded the an indigenous vehicle, "however ugly or slow it may be." The project stalled and the model never reached mass production. Putting aside the issues of logistics, fit, and finish, with which the Nyayo Pioneer obviously struggled, even the basic concept was flawed. It helps to understand the true size of Africa, a figure often underestimated in the West. Africa covers an area of 30,221 square kilometers - more than China (9,597), the United States (9,629), India (3,287), Mexico (1,964), Peru (1,185), and much of Western Europe - combined. Now consider that the majority of roads in rural areas of sub-Saharan Africa are highly degraded. It is estimated that two million kilometers of roads have become virtually impassable after decades of poor maintenance and neglect. Mobilizing this developing world, then, would seem to require something more durable, more capable - and yet more affordable - than the average car. For decades, the vehicle of choice here was the Peugeot 504. Indeed, some say that it is still the 504, a French line of sedans, wagons, and pick-ups which launched in 1968 and which were still assembled in Kenya some thirty years later, well past their sell-by date in Europe. The 504 is undoubtedly the most common car in the border regions of countries such as Mauritania, Senegal, Mali, Burkina Faso, and Guinea, where millions rely on “bush taxis” to visit family or sell products at market. As BBC Top Gear once surmised, "Many imagine that it was Land Rover or Jeep that brought internal combustion to the world's most impregnable backwater; but no, it was the Peugeot 504." There isn't a mechanic on the African continent who doesn't know how to fix the Peugeot. Rumor has it that at least one Kenyan tribe sings of its rugged, no-nonsense construction, uncompromising reliability, and the ease with which it can be serviced. The 504 was so honest as to put the overstated imagery of American truck commercials to shame. It was hardworking, utilitarian; yet with an inimitable touch of flair. Peugeot simply does not make vehicles like this anymore. Very few do. Imported used cars don't quite do the trick. They're hardly designed for the transport needs of Africa's mass market and, with little financing available for used cars, they cost too much to buy and run. Meanwhile, new-car sales in Kenya have not exceeded 10,000 annually in the past ten years, with unofficial figures placing the total for last year (2016) at just 6,333. Yet the 504 must, somehow, be replaced. It has been claimed that people pay up to seventy-five percent more for their daily goods due to the lack of mobility. To compound the problem, the lower classes, with annual household income less than $3,000, also spend thirty-nine percent of the African market's total expenditure on transportation. Sometimes, solutions can come from a most unlikely place. Joel Jackson, who was but a teenager in Sheffield when the Nyayo Pioneer first saw the light of day, in 2009 found himself walking long distances to serve clients at a social enterprise which encouraged farmers to plant eucalyptus trees along the Kenyan coast. Having seen the transport challenges first hand, this Imperial College graduate in computer science got to thinking about how to solve them. "I thought it could be game-changing if we could provide a platform for mobility that would bring out latent entrepreneurialism across Africa," he told Wired. 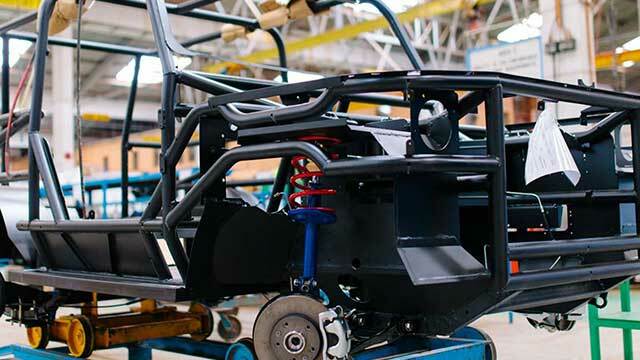 For the past few years, Jackson's Nairobi-based Mobius Motors has looked to succeed where others have failed: to indigenously design, build, and sell a modern car which can cope with all that Africa has to throw at it. Seven years ago, they began with the fairly ungainly "Mobius One" prototype, using a one-liter, four-cylinder Toyota engine and the skills of local welders and mechanics. "It had a tubular steel frame and off-the-shelf parts. it looked like a dune buggy, took ten months to build, and cost $14,000," reflects Jackson. Ugly though it was, "Mobius One" got the basics right. It was enough to commission work on a more complex vehicle began, with Jackson reportedly securing £250,000 in venture-capital funding and pinching the Head of Engineering and the Purchasing Manager from two global car makers, as well as a team of product and engineering managers from Kenya with experience in local car assembly. Mobius One morphed into the "Mobius Two" in September 2011. Its engine had grown, to 1.6 liters, with eighty-six horsepower and ninety-four pound-feet of torque. Computer-aided design was used to validate prototypes and enable integration with appropriate off-the-shelf vehicle parts. The tubular-framed (with 1.5-to-2-inch tubular, MIG-welded steel pipes), eight-seater SUV with a top speed of about seventy-five miles per hour weighed twenty-eight hundred pounds, had nine inches of ground clearance, and could carry thirteen hundred and seventy-five pounds worth of cargo. It had no alloy wheels or electric windows; indeed, no windows at all, save for the windshield. The prototype cost $15,000, but it was far superior to its predecessor in terms of engineering and design, and had taken just three months to build. Plans were made to produce a first batch of fifty, at the rate of two per day, with hopes of bringing the cost down to $6,000. But Mobius needed more investment to get things underway. $50 million was secured from the New York-based Pan-African Investment Company (PIC). The 2015 target price of the finished vehicle - dubbed "Mobius II" - climbed from $6,000 to $10,500 - still a third of the cost of a new Corolla in Kenya, and about the price of an eight-year-old model of the Toyota compact. And an eight-year-old Corolla is not designed to operate on degraded terrain reliably, nor carry the heavier loads common among consumers in these areas. Now, for 2018, there is the next-generation Mobius II. It's a far more complete vehicle. It reportedly has about forty-five percent local content, with the 1.8-liter 16-valve VVT Toyota engine and some other parts being imported. There's a $12,600 Cargo model, with two seats, a $14,000 "Adventure," with five, and even alloy wheels, air conditioning, and an infotainment system on the $15,250 Adventure Plus. You can have the Cargo in any color so long as it's black - and the Adventure and Adventure Plus are made in just two and three colors, respectively, to keep production costs down. 235/70 R16 All-Terrain tires and double-bar bumpers are standard on all but the lowest model. Coil springs up front make for a smooth ride, but leaf springs have been retained at the rear for load carrying and articulation. Four-wheel drive is not available, but with the exception of the limited-production Dangel model, Peugeot's 504 did well enough without it. It is said that Africa has the raw materials to feed the world's factories. Mind you, some blamed the failure of the Nyayo Pioneer on a lack of the same. Whatever the case, Africa has certainly struggled to create a manufacturing base. "We have all the resources here. We have the talent pool here," Mobius sales manager Aman Ghai told South Africa's Biznews three years ago. "It is just getting over the fear." Bureaucracy and corruption, too, are a major stumbling block. "Many companies resort to slipping bribes to truculent officials to ease the way," wrote Miles Downard for Biznews, while adding, "Mobius says it has a 'zero tolerance' policy on corruption." Mobius is not the only aspiring carmaker in east Africa. In neighboring Uganda, Kiira Motor Corporation aims to build up to a thousand cars a year beginning in 2018, all designed and made locally. Unlike Mobius, Kiira plans to target mainly office workers or executives. Initial plans called for a vehicle similar to Toyota's Camry. Mobius is also not the only automaker seeking a low-cost, indigenous alternative to mass transportation. Several years ago, the Tata Nano was supposed to revolutionize the way low-income families the world over moved themselves. "But as it turns out, even those with no money don't want to be seen in a vehicle known primarily for its cheapness," wrote Auto Blog. However, rather than targeting the bottom of the pyramid directly, Mobius Motors sells its products to the middle classes who then offer services to the bottom of the pyramid. Its vision is a transport platform that empowers local entrepreneurs to mobilize the developing world. Jackson says that Mobius aims to empower transport entrepreneurs across Africa not just with more appropriate vehicles, but with the financing and business advice needed to operate a sustainable transport centric business. "We want to enable people to innovate," he told Wired. "By doing that, we can unlock huge growth in transport-related services." In short, Jackson maintains, Mobius is building a revolutionary platform for mobility while promoting job growth in Africa with each new car built and serviced. "It's a pretty audacious vision to create a car company in Africa from scratch," Jackson admits. "But we're confident it will be a viable business." What Can Language Not Do? How Much Do You Know About Hungary? What Did Helvetica Tell You Today? Which Are the 'Easy' and 'Hard' Languages? So You Want to Learn Hindi? Whose Pasta is it, Anyway? How Many German Words Do You Know? Why is Having a Bilingual Brain a Benefit? La Tour Eiffel: Ça, c'est Paris! How Does the Bilingual Brain Work?